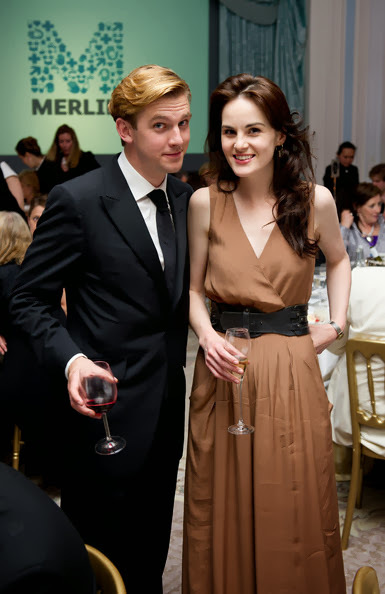 What happens to Lady Mary this series? "She’s stuck in limbo after Matthew’s death. For me it felt like going back to series one because there’s that coldness about Mary again. I like that side of her character, so I enjoyed playing it. As you saw from the first episode she finds it difficult to bond with her baby at first because he reminds her of Matthew. But she’s an artistocrat with a nanny so she’s not exactly a struggling single mother!" Has Mary’s grief presented a range of challenges for you? "I love kids, so it was hard to ignore my instincts while we were filming those scenes. I just wanted to coo over the babies. It was also really tough doing the scene in the first episode when Mary is so brutal towards Carson. I love that it’s him who pulls her out of her depression, but it’s hard to be unpleasant to Jim Carter – he’s the nicest man in the world!" The public were outraged at Matthew Crawley's death at Christmas. Were you surprised by the reaction? "Matthew was a really well-loved character and Dan was such a wonderful part of the show, so I think it was inevitable that people were angry – they felt they had invested a lot in Matthew and Mary." "I was watching the episode with my family, so I sat there with a box of Ferrero Rocher wondering what their reaction was going to be. They couldn’t believe I hadn’t told them. I had lots of texts saying, 'No!!'" Do you think that death was the only plausible exit story line for Matthew? "He couldn’t very well just disappear never to return. It was inevitable that he had to die, but reading that last episode was just heartbreaking."